The 64 Gua Qi Men Dun Jia (64卦奇门遁甲) is diamond of Sanyuan (三元) Fengshui courses that I have been waiting for years and it’s finally here and I couldn’t believe it when it was inform by Dennis. Master Leyau have been very kind to share this very secret knowledge of Sanyuan(三元)64 Gua Qi Men Dun Jia(奇门遁甲)and this will help one to close the gap in pursue of the Golden Nectar of San Yuan(三元) Fengshui knowledges and applications. The 3 trinity of 三元 Fengshui has always mention when one have discussion on the very topic and actually how many people really understand the real meaning of 天 (Heaven : Season), 地 (Earth : Fengshui) and人 (Human : Birth). Have you ever wonder what is common link or DNA that will bridge the 3 trinity. To keep the story short and sharp, this is the course that will reveal a lot of mystery or missing gap that kept me pondering and wondering all these years. After attending Master Leyau San Yuan 64 Gua Qi Men Dun Jia (三元64卦奇门遁甲), I finally could understand Ceng Zi Nan (曾子南) materials and even able to fully appreciate and use Ceng Zi Nan (曾子南) Almanac (万年历) and Qi Men Calendar (奇门历表) to the fullest. I am thankful to Master Francis Leyau for bringing to light for the first time the secret knowledge of San Yuan 64 Gua Qi Men Dun Jia. The charts were first published by the famous Taiwanese master Zeng Zi Nan, and many years later, a course that teaches how to derive and use them. One of the last and best kept secrets of Xuan Kong Feng Shui! This knowledge is based on the traditional San Qi Liu Yi (3 rare 6 protocol) and Ba Men (8 Door) plates, that are expanded into 64 directions using the Shao Yong sequence. You will then learn how to use them in conjunction with date selection to find the best timing for a given building or grave. In the last day of the course, sifu shows how to observe the phenomena that manifests when such powerful and precise timings are chosen. The student also becomes proficient in making his own Qi Men Dun Jia calendar from scratch. I strongly recommend to all Feng Shui enthusiasts and date selection practitioners in particular to attend this module. I have previously learned with other masters but it was at the Central Academy of Feng Shui that I found the teaching is authentic with the straightforward practical applications and above all, yielding the best results. 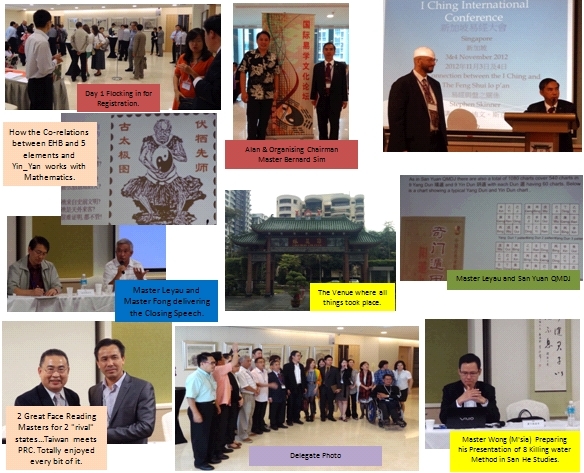 The 2 days was well spent in helping to promote the study of Traditional I-Ching. Here many Master of their Respective field was here to present their research and share their experience with all of us. In fact, I found that there are so many things to learn from them but most of all is the philosophy of life and the rich experiences they bring along. No books can ever teach you the experiences they have gather over the many years being a “人”. You can also feel the strong atmosphere of cooperation where they do no call themselves San He or San Yuan but collectively under the auspicious of I-Ching Study. The Tao of Respect is prevailing at all times. Many interesting topics were presented but the one that was very interesting was the Feng Shui Lo Pan by Master Stephen Skinner, the only westerner in a Chinese speaking Conference, 2 Face reading by both Master Chen, The corelation between Maths and I Ching, San He 8 killing methods, Talisman method, Feng Shui Case Study of 2 factories in China and of course San Yuan QMDJ. The next conference will be in China, Yan Bian a beautiful place overlooking 3 countries. See you there! San Yuan Qi Men Dun Jia….the ultimate skills of Timing. San Yuan Qi Men Dun Jia is one of the most sought after art of QMDJ but unfortunately not much of it’s information is available to the public. One of the master who popularize this art was Master Zhen Zi Nan (曾子南). Master Zhen was one of the best San Yuan Master known to date. He was famous for 2 arts, QMDJ & the other is the Xuan Kong Da Gua which is more famously known as Xie Zi Fa. 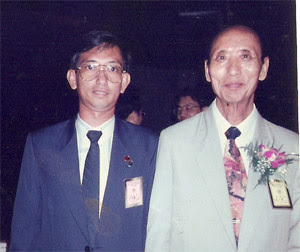 Master Leyau with Master Zhen (Right) during The 10th International Conference of Yi Ching Learning in Taiwan 1993. In the art of Qi Men Dun Jia, typically there are 2 main styles, one is the San Yuan version which is based on the 64 Hexagrams while the the other is based on the 9 palaces, 8 gods, 8 door,etc..and collectively called the San He version. Briefly, the art of QMDJ is mainly used to find the auspicious hour to get or do what you intended but the approach is different within the 2 arts of QMDJ. The San Yuan version is an art refined to a level that it pin points the exact time period within a Chinese Hour or typically a 2 hour in our current time system after doing a Xuan Kong Da Gua Date Selection. A seasoned practitioner will be able to predict the situation/weather/phenomena during that short most auspicious period. Other practical application is like to set headstone of a tomb. Such is the real use of San Yuan QMDJ. This is what precisely Zhen Zi Nan is famous for. Using San Yuan QMDJ to select dates and obtaining the desired results through observing the phenomena happening. This greatly enhanced the strength of the feng shui that he does just like a catalyst in a chemical reaction. Timing is important in what ever we do in life. Very simple example is, “is this the right time to talk to boss regarding this matter?”. Is this the best time to buy this property? Timing presents it’s question to us on a daily basis. While I am not advocating that every thing that you do, has to be date selected using QMDJ, what I am trying to say is that Timing is important and that choosing the right time gives us the best opportunity to succeed especially when you are setting the Feng Shui. San Yuan QMDJ is the ultimate skill in Date Selection 擇日 in Feng Shui System. Qi Men Dun Jia deals with identifying the exact time to perform an action in a particular location in order to get the desired results. The exact time is identified based on the observation of the occurrence of predefined ‘phenomena’. The desired result will be achieved when we commence an action upon observance of the predefined phenomena. Examples of some phenomena are “birds starting to sing in a nearby tree” or “a woman dressed in red walking by.” The Qi Men Dun Jia Charts describe the phenomena that must occur in order for the desired results to be obtained. The San Yuan method of Qi Men Dun Jia is based on the 64 Hexagrams of Xuan Kong Da Gua The 9 Square Method (San He) is the basic method of Qi Men Dun Jia which involves fitting the 10 Heavenly Stems, Eight Doors, Nine Stars and Eight Gods into the chart composed of the 9 Squares. One of the 10 Heavenly Stems will be ‘missing’. The 9 Square Method involves locating the ‘missing’ Heavenly Stem in the 9 Square to identify the phenomena that needs to occur. The San Yuan Method is a hidden secret and the ‘key’ to the practice of San Yuan Xuan Kong Feng Shui. The San Yuan Method is based on the 64 Hexagrams. There are 1080 Qi Men Dun Jia Charts. Each chart is divided into 64 Hexagrams of Xuan Kong Da Gua. There is a predefined phenomenon for each of these 64 Hexagrams. The Xuan Kong Da Gua Method of selecting an auspicious time to commence an action only allows us to identify the appropriate ‘Chinese Hour’. One Chinese Hour is equivalent to two Western Hours. It allows us to identify within this Chinese Hour the exact ‘moment’ when the action must commence in order to obtain a guaranteed result. This ‘moment’ is when a predefined phenomenon is observed to occur. The effectiveness of applying Qi Men Dun Jia in actual practice lies in our ability to observe the occurrence of the predefined phenomena. Sometimes the phenomena take a slightly different form compared to what have been described in the old text and it takes an experienced practitioner to spot it.